1Rhodes, the main town of the Dodecanese Greek archipelago, is a major Mediterranean tourist destination and a UNESCO World Heritage since 1988. As such, it offers valuable insights into the way in which a religious minority, such as the Roman Catholic community, can interact with the mainly Orthodox context and the UNESCO framing of the place. The local Catholics are situated in an intricate religious and heritage geography that comprises the various monuments of western European states (from the time of the Crusades to the end of the Italian colonial period), the hegemony of the Greek Orthodox Church and the touristification of the territory and the population. The Catholic Church is known as an Archdiocese of the Catholic Church in Greece, with more than 1,000 followers, primarily composed of the descendants of Italian people who married local Greek Orthodox partners during the colonial period,2 retirees from northern Europe, and Albanian and Filipino workers. The Church’s properties comprise three small parishes, five worship places, two cemeteries, one monastery, and several other secondary buildings. There is only one priest who acts as the Vicar General of the Archdiocese, as parish priest and as head of the Franciscan monastery. 2In recent years, the local clergy and their closest parishioners have engaged in implementing wide-ranging and profound heritage activities to strengthen the position and collective memory of the local community. They have consciously challenged the island’s homogeneous cultural heritage narrative, which is mainly based on the presence of the vestiges of the Crusades, and have proposed their own version of local history. Outside of the official networks of heritage specialists, institutions, and commitments, the Catholic Church has sought to capture the attention of tourists and local people through a series of heritage activities that reinterpret and adapt the “heritage technology” (De Jong and Rowlands 2007) to their own stock of properties. 3This text presents an ethnography of the heritage practices of the Catholic community in Rhodes and addresses the presence of their autonomous agency among the island’s official cultural heritage institutions. Which version of local history is retained, which one is rejected, and which is adapted? What is the influence of the town’s UNESCO World Heritage status on the community? How do the Catholics go about constructing their own cultural heritage? More broadly, can we talk about a self-heritagisation in such processes outside of the official channels of cultural policies? And what about “participation” and “community,” when the heritage activities of the group, the leader, and the common actors seem autonomous from the legitimised cultural sector? 2 Where Does the Catholic Heritage Come from? 5The particularity of this place is also evident in the multi-confessionalism and its enduring religious heterogeneity. As a military and symbolic base for the Crusades, a host land for the Jews rejected by Spain, an Ottoman territory in the 18th and 19th centuries, an Italian colony in the first half of the 20th century, and part of a Greek archipelago, Rhodes is characterised by a profound survival of the different forms of monotheism. However, Orthodoxy is the official state religion, and followers of other denominations are required to practice their religion discretely. 4 For the analysis of the Italian archaeological action, see Livadiotti and Rocco 1996. 6The city of Rhodes was added to the list of UNESCO World Heritage sites in 1988. Tourism and heritage transformations have contributed to conserving a multi-religious landscape although the Crusades monuments are the most emblematic symbols of Rhodes. Vestiges of Antiquity, medieval Christian buildings, former mosques, and a few monuments of the Jewish and Catholic communities are preserved as symbolic and economic resources. Public heritage administration makes nonetheless a selection among the various religious properties. By valorising antique and medieval religious vestiges as the main form of heritage and marginalising other elements, the religious and heritage topography of Rhodes remains a complex multi-layered construction, responding to the “global hierarchy of values” described by Herzfeld (2004). The classical and medieval monuments have been the central domains of publicly funded heritage conservation for many decades, including during and after the Italian colonisation. During the 20th century, French and Italian architecture preservation offices made huge efforts to save and rebuild the manifestations of the Christian presence.4 This endeavour was continued by the Greek administration and, as a consequence, this kind of heritage is today the most well preserved and renowned on the island, attracting some one million tourists each year and cited in all the tourist guides published on Rhodes. In parallel, a diaspora association of former Jews from Rhodes manages local Jewish heritage (see Sintès 2010a, 2010b, 2011); there are very few Muslim monuments taken on by the community (Kaurinkoski 2012) and Italian colonial architecture does not form part of the usual guided tours of Rhodes. Jewish, Muslim, and colonial Catholic vestiges are therefore less visible than their medieval counterparts, despite the efforts of the local minority groups. 7In particular, when the Italian occupation came to a sudden end following World War II, the symbols of Italian colonisation were erased by the Greek power. Catholic churches were turned into Orthodox ones, and the objects of the cult, such as statues and liturgical instruments, disappeared with the Italian people and religious congregations. Since the 1990s, a wave of Catholics, comprising Italian tourist entrepreneurs, Greek Orthodox and Catholic mixed couples, and local parishioners or history scholars have renewed the interest in Catholic heritage. A series of works on Italian occupation memories have been published in Italy and various scholars have investigated this recent past (Marongiu Buonaiuti 1979; Doumanis 1997; Pasqualini 2005; Menascé 2005; Peri 2009; Vittorino 2004; Pignataro 2010). The film Mediterraneo (1991) also played a significant role in this renewal of the Dodecanese history in Italy (Gaetano Ciarcia, personal communication, July 8, 2011). The priest in charge of the Archdiocese develops the renovation of the Catholic places and leads a renewal of the rituals to better include the tourists. These actions state the catholicity of Rhodes and contribute to define the social and religious frontiers of this minority group. Thus, the Catholic heritage practices fit with the classical understanding of cultural heritage within the social sciences, that is, as a social construction that serves to manifest, materialise, and transmit a representation of the group. 8Nevertheless, the methods and scales of the heritage work undertaken by the Catholics seem quite different from the usual system of cultural heritage implementation and its interpretations. Unlike other cases of ethnic minorities seeking recognition, which are usually facilitated by cultural development NGOs or international bodies, the Catholic heritage work in Rhodes is characterised by the absence of any ecclesiastical institution dedicated to the definition, display, and conservation of the material considered as heritage by the community. During the Italian period, the Catholic Church in Rhodes was associated with a politically legitimized set of properties, including the medieval vestiges of the Crusades and the ancient shrine of Filerimos. Since the end of World War II, the Catholics have lost their dominant position and have had to learn to become a religious minority. They now turn their few churches, monuments and places into cultural heritage, taking into account the current tourism and UNESCO context. How have these historical developments affected the heritage landscape of Rhodes? What instruments and narratives frame the multi-layered local heritage system? In the following, I will show that, beyond the supremacy of the Crusades monuments, the UNESCO heritagisation process of Rhodes has lead to 1) the cancelation of the religious nature of the territory and monuments; 2) the creation of some “unheritagised” spaces, in which the Catholics, as well as the Jewish community, have been able to develop their own heritage activities. 9The Rhodes’ application for UNESCO World Heritage status submitted in 1988 focused on the medieval town built by the European powers involved in the Crusades and the military order of Saint John of Jerusalem (later known as the Order of Malta). Rhodes was one of the mightiest fortresses in the Mediterranean, symbolising the Occidental presence next to the Holy Land. Following the evaluation provided by ICOMOS, the argument for UNESCO recognition centred on the fact that the fortress was representative of a certain style of architecture: “Rhodes is an outstanding example of an architectural ensemble illustrating the significant period of history in which a military hospital order founded during the Crusades survived in the eastern Mediterranean area in a context characterized by an obsessive fear of siege” (ICOMOS 1987). Furthermore, they emphasized other characteristics: the coexistence of several religions; the remains of various architectural traditions; and the French and Italian efforts to study and reconstruct the island’s medieval buildings during the 20th century. However, the diversity and hybridity of Rhodes’ architecture and history were not central factors in the inscription, the “gothic” walled city remains, until the present day, the principal object of the application and the international assessment process. 10As is the case for many other World Heritage sites, one finds in Rhodes a mechanism called surclassement by Daniel Fabre (2010), i.e. a tension between the items chosen to be preserved and the simple mention of the existence of Ottoman, Muslim, Byzantine or local architecture within a Christian and European ensemble. Buildings and sites of the walled city UNESCO perimeter are adorned with panels and boards detailing name, date, and opening hours. These panels are materially identical for any kind of cultural heritage items included in the UNESCO area and give no information on the previous history of the spaces. As Pierre Sintès has argued, “this process of display and heritagisation has led to the ‘invisibilisation’ of a significant part of the history of these places” (Sintès 2011: 1101). One can observe the same logic at work in the official tourist map of the town. This map is displayed at each entrance of the old town and shows the name and location of 71 “historic buildings,” only ten of which are relics stemming from the Ottoman, Jewish, or Antiquity cultures. The buildings and monuments are colour-coded according to the political chronology of Rhodes rather than the range of denominations practiced in the town. The heritagisation of the walled city of Rhodes thus tends not only to cancel the local history, but also to obscure the religious qualities of the heritage monuments, or at least to blur the multi-confessional character of the island. 11Despite this general obfuscation of Rhodes’ religious diversity, the Catholics seem to take advantage of this local heritage configuration. They organise the restoration of their buildings, in which they can receive about 300 tourists during summer masses, and publish a significant number of documents for their visitors. However there is no direct involvement of the Catholics in the UNESCO’s heritagisation of the city, the “heritage-scape” of Rhodes (DiGiovine 2008) creates in fact suitable conditions for the constitution of an alternative and parallel Catholic heritage space. Both the presence of numerous Catholic tourists and UNESCO’s narrow focus on the medieval walled city have generated a congregation ready to fill the Catholic churches in summer and created empty and “unheritagised” spaces in which the local minority has been able to invest and develop its own heritage and identity constructions.5 Little attention has been paid to this phenomenon by scholars: Studies of heritage-making in World Heritage sites usually analyse how the rules of the international convention are implemented in a given context and do not address their “collateral effects” on the local subgroups and minorities. In Rhodes, the heritagisation of the walled city has consolidated an institutionalized narrative of the medieval space and time – what one might call a local authorised discourse of heritage (Smith 2006) – yet the Catholics have succeeded in undertaking their own heritage conservation actions in the immediate vicinity of the UNESCO site. What exactly does this alternative heritage planning involve? How is it different form UNESCO’s universal guidelines and devices? And how are the Catholic heritage conservation efforts legitimized? 12The current network of Catholic worship places are mainly located in the modern colonial city of Rhodes and includes only 25 per cent of the buildings used by the Archdiocese during the colonial period, most of which have been given to the Greek Orthodox Church. The Catholics have a sense of having been robbed of part of what they had accumulated and have a profound knowledge of their ancient properties. They do not express this sentiment in a vindictive way. The Vicar general and his closest allies disseminate a nostalgic heritage discourse through a series of actions intended to preserve their current properties and to recall the memory of their lost heritage. Most of the current Catholic population has only a very recent link to Rhodes, being part of the contemporary influx of international visitors who have chosen Rhodes as a secondary residence. 13However, the way they speak and think about the Catholic buildings and the past of the community are symptomatic of their attachment to the island and its heritage. It is not uncommon to hear a Catholic living in Rhodes, speaking about “our cemetery” or “our former sanctuary in Filermos,” Even if he never received key life sacraments or does not keep the grave of his family in the Dodecanese. As a lay member of the parish choir once told me (June 5, 2011): “The Cathedral and the headquarters of the Orthodox Church were ours before the war.” In the same way, the priest – an English man educated in Jerusalem - often underlines that it has been hard work “to find the last ritual objects of the Italian Churches,” and that “many of our objects disappeared at the end of the colonial period” (September 26, 2010). This discourse of appropriation of the places and objects of the past contributes to the construction of the Catholic feature of the lost properties, as well as that of the churches remaining in the community’s hands. While UNESCO is concerned solely with the architectural qualities of the walled medieval city, the Catholics place emphasis on their former churches and give them a religious connotation in priority. 14The strategy of qualifying their heritage as a religious one is evident in all their heritage actions towards the properties they have in hand today. Indeed, the fact that their former churches, like the Cathedral or the sanctuary of Filerimos, are still visible in the landscape, but transformed following the Orthodox architectural canons, likely reinforces the feeling of loss and galvanises their need to underline the confessional origin of these properties. Nonetheless, the various heritage-making activities undertaken by Rhodes’ Catholics present a different degree of religious claim and can be listed according to the types of objects they choose and the kind of heritage “technology” they use. 15The first activity is, obviously, the restoration of the buildings and private spaces, including the monastery and the cemeteries of the Archdiocese. Since the completion of the restoration work, the painting, the roofs and all the exterior spaces are as new and as clean as the interior of the churches. For instance, the care of the Rhodes town cemetery, which includes a main chapel, many funeral monuments large enough to accommodate a family mass, and various lawns and gardens, is a key activity of the parish team. Any renovated building belonging to the Catholic Church is marked by a marble plaque featuring the name of the shrine in Latin and Modern Greek (and sometimes in English), as well as being mentioned on the Archdiocese website, accompanied by a series of photographs. Plaques and web presentations tend to create an ensemble of historical places, claimed as Catholic. They function as a religious appropriation technique of the “unheritagised” modern city centre, built during the Italian period next to the walled city and create an alternative heritage space to the UNESCO site. 16The second activity undertaken by Rhodes’ Catholic heritage makers consists in the collection of liturgical objects and books from the Italian Catholic churches and institutions. Some of these items have been found in the places of worship themselves; some were kept by Catholics in their homes, while others were sold in local antiquaries shops. Each of the hundred or so pieces and various fragments of different institutional libraries are displayed on bookshelves in a room of the monastery library, without any apparent organization and without any information on their origins, names, or functions. In the memory of the priest, the objects are nonetheless linked to their churches of origin, constituting a mental map of former Catholic places in the Dodecanese. 17Unlike the naming and labelling of the buildings, the collection of objects and books seems to be a part of a more intimate heritage and memory space of the community, not only because these items are displayed without any information, but also because few tourists are permitted to enter the monastery’s room where they are kept. Thus, liturgical objects and ecclesiastical books form a specific set of religious artefacts, whose audience seems to be different from that of the religious constructions embedded in the public space of the city. There is a resemblance here to the amateur collections of pottery and porcelain described by Thierry Bonnot (2002), which are not systematically inventoried but nonetheless reflect an extensive knowledge of a specific material culture. 18In contrast to the objects and book collections, the historical archives received a specific, complex and professional treatment and are used as religious administration as well as historical and memory resources. The archives contain church books (registers of births, marriages, and deaths) from the former parishes and of some chronicles of the monastery. All the documents were classified according to the Vatican directives on historical archives, which was the responsibility of the voluntary archivist of the community, a now retired Italian women who married a Greek partner during colonial times. Many of the Italian people who previously lived in the Italian Dodecanese can ask for official records as proof their life events.6 Moreover, the monastery’s and parishes’ archives have played a central role in the appropriation and recognition of Italian Catholic history and memory at the community level. As I have already mentioned, most of the Catholics currently residing in Rhodes are not native to the island, and the archives have thus enabled them to learn something about the cultural heritage of their new home. The investigations undertaken since the early 2000s by the archivist of the community (Conte Jennakis 2007) were crucial to this appropriation of the past. In 2013, after more than ten years of work, she finally published a book in Italian presenting an inventory of the former churches, entitled “Le Chiese Che Furono...Nelle Isole Italiane dell’Egeo (Dodecaneso Italiano)” (“The Churches that were…in the Italian islands of the Aegean (Italian Dodecanese)”). In a similar vein, in 2010 the parish priest wrote a short hagiographic booklet in Modern Greek on Saint Anthony of Padua in order to present and promote the singular position of the saint in the local religious landscape. For, being a Catholic saint, Anthony of Padua is also honoured by Orthodox followers who participate in the weekly devotion and collect blessed bread for their family.7 Thus, the management and care of the historical archives combines preservation of the memory of the community, confessional assertion and an administrative public service. The production and use of the historical archives of the Rhodes Catholic community generate a need to be interpreted not only as heritage phenomenon, but also as religious manifestations of identity. 19Short descriptive leaflets are the last category of heritage tools produced by the Catholics. These free documents are often placed at the entrance of the current Catholic churches and describe a single and little item of the Catholic local culture. They are formed of a series of folded, colour-printed pages, which describe, in Modern Greek, English, Italian, and Polish, items such as the festival of Saint Anthony, the Nativity scene of the Franciscan monastery, or the organ of the Saint Francis Church (the largest Catholic church in the archipelago). It should be noted that the pamphlets deal with the intimate scale of the denomination’s culture, for they often remain indoors, as the archives and books collections. Such items are not as visible as the renovated churches, with their marble plaques and newly painted facades, they need to be publicised and promoted with specific media. They are also important marks of differentiation between Catholics and Orthodox. Saint Anthony is a Catholic Franciscan holy figure, and even though Orthodox Christians pray to him, he remains a Catholic saint outside of the Greek Orthodox pantheon. Saint Francis, the founder of the Franciscans, who had a special devotion to the Infant Jesus is said to be the inventor of the Nativity scene tradition. The Rhodes’ one is a large three-dimensional model of Jesus’ birth, exhibited during the Christmas season, with little statues in a realistic Mediterranean landscape. By contrast, Greek Orthodox Christians only venerate two-dimensional icons of the Nativity. Finally, the pamphlet on the organ also highlights the important musical difference between the two confessions: The Orthodox liturgy is accompanied by choir singing and a large part of the text is a psalmody by the pope and the followers, while in the Catholic tradition instrumental music, and especially the organ, is the standard complement to the mass. 21Catholic heritage-making in Rhodes is motivated more by moral and religious ends than by an interest in economic benefit. At both a local and global level, utilisation of cultural properties is said to be a redemptive way of creating market value and ensuring local development. This is partly true for Rhodes, where tourism has led to a tremendous development of the island. Yet as the example of Rhodes' Catholics makes apparent, minority heritage processes do not necessarily match this money driven schema. The Catholics rather want to attract the tourists, to have a better representation in the local religious landscape and to convert new followers. So they fashion and provide alternative heritage discourses and devices in order to survive as a local minority, outside of the official channels of cultural policies. In this sense, the moral issues of “community” construction are central in their agenda, and they try to build a unified religious ensemble, with its past, its artefacts, and its specificities. Moreover, as Bennet (2009) has pointed out, despite the establishment of departments specialized in archives and cultural goods within the Vatican, few studies have analysed the development of religious heritage and cultural policies or dealt clearly with religious control of heritage. Such a reading of heritage-making should open new paths in the critical analysis of the religious use of heritage and will challenge the common understanding of the functions of heritage. The Catholics do not “collaborate” with cultural heritage managers in the same way as an ethnic minority group in Canada or Brazil might, by working closely with a museum or an NGO to defend their cultural and political rights. It is for this reason I take “self-heritage” to be an appropriate term with which to describe the Catholic heritage process in Rhodes. 22Many authors have stressed the increasing occurrence of such heritagisation models in Europe. In recent years, the French anthropologists Thierry Bonnot (2002), Michel Rautenberg (2003), Jean-Louis Tornatore (2010), and Nicolas Adell (2012) have proposed to take into account collection, transmission, and care practices engaged in by cultural associations, proletarian activists, pottery amateurs, or brotherhoods of artisans and to include them within the general category of cultural heritage activities. Cultural heritage management and recognition of ethnic minorities have also attracted growing attention from social scientists in the USA, the United Kingdom, and Australia, where the terms “indigenous curation” (Kreps 2005) “non-official” heritage claims (Harisson 2013), “autonomous archives” (Moore and Pell 2010), or “public folklore” (Baron 2010) have been better able to capture locals’ and group members’ participation in heritage-making performances and practices. If collaborations with administrative heritage services are not exceptional, the minority groups taking on their past have demonstrated a desire of independence and autonomy. They have forced anthropologists to rethink what heritage-making is outside of the classical state, national, and elitist framework of cultural heritage - who are the main actors in such processes - and what motivates these small groups. 23Additionally, if the majority of the literature on cultural heritage converges on its role in the construction of collective identity among particular ethnic, religious, or political groups, the Catholic use of cultural policy can also be interpreted as a mode of belief and a means to live one’s faith. Moving from cultural heritage to religious care of the past allows us to integrate heritage actions into the repertory of religious activities. This renewal of the analysis from a more open, present-day and grassroots standpoint offers alternative perspectives on both contemporary religious practices and cultural heritage claims. Adell, Nicolas (2012): The French Journeymen Tradition: Convergence between French Heritage Traditions and UNESCO’s 2003 Convention. In Heritage Regimes and the State. Regina Bendix, Aditya Eggert, and Arnika Peselmann, eds. Pp. 177–193. Göttingen: Universitätsverlag Göttingen. Albera, Dionigi, and Benoit Fliche (2012): Muslim Devotional Practices in Christian Shrines: The Case of Istanbul. In Sharing Sacred Spaces in the Mediterranean: Christians, Muslims, and Jews at Shrines and Sanctuaries. Albera Dionigi and Maria Couroucli, eds. Pp. 94–117. Bloomington: Indiana University Press. Baron, Robert (2010): Sins of Objectification? Agency, Mediation, and Community Cultural Self-Determination in Public Folklore and Cultural Tourism Programming. Journal of American Folklore 122 (487): 63–91. Bennet, Oliver (2009): On Religion and Cultural Policy. Notes on the Roman Catholic Church. International Journal of Cultural Policy 15(2): 155–170. Bonnot, Thierry (2002): La vie des objets. Paris: Éditions de la MSH et Mission du Patrimoine ethnologique, collection Ethnologie de la France. Conte Jannikis, Lucia (2007): L’archivio di Santa Maria della Vittoria in Rodi. La Stella di Rodi: 11–15. – (2013): Le Chiese Che Furono... Nelle Isole Italiane dell’Egeo (Dodecaneso Italiano). Rhodes: Texni. De Jong, Ferdinand and Michael Rowlands, eds. (2007): Reclaiming Heritage. Alternative Imaginaries of Memory in West Africa. Walnut Creek: Left Coast Press. Di Giovine, Michael (2008): Heritage-Scape. UNESCO, World Heritage, and Tourism. Lanham: Rowman and Littlefied Publishers. Doumanis, Nicholas (1997): Myth and Memory in the Mediterranean: Remembering Fascism's Empire. New York: St. Martin's Press. Fabre, Daniel (2010): Habiter les monuments. In Les monuments sont habités. Daniel Fabre and Anna Iuso, eds. Pp. 17–51. Paris: Éditions de la Maison des Sciences de l’Homme. Frazee, Charles (2002): Catholics. In Minorities in Greece. Aspects of a Plural Society. Clogg Richard, ed. Pp 24–47. London: C. Hurst & Co. Publishers. Greenwood, David (1989): Culture by the Pound: An Anthropological Perspective on Tourism as Cultural Commoditization. In Hosts and Guests. The Anthropology of Tourism. Smith Valene, ed. Pp. 171–186. Philadelphia: University of Pennsylvania Press. Harrison, Rodney (2013): Heritage: Critical Approaches. New York: Routledge. Herzfeld, Michael (2004): The Body Impolitic. Artisans and Artifice in the Global Hierarchy of Value. Chicago: University of Chicago Press. Kaurinkoski, Kira (2012): The Muslim community in Kos and Rhodes: Reflections on social organisation, migration and identities. In Balkan Encounters: Old and New Identities in South-Eastern Europe. Lindstedt Jouko and Max Wahlström, eds. Pp 47–78. Helsinki: University of Helsinki. Livadiotti, Monica, and Giorgio Rocco (1996): La presenza italiana nel Dodecaneso tra il 1912 e il 1948. La ricerca archeologica, la conservazione, le scelte progettuali. Catania: Edizioni Del Prisma. Marongiu Buonaiuti, Cesare (1979): La politica religiosa del fascismo nel Dodecanneso. Napoli: Giannini. Menascé, Esther Fintz (2005): Buio nell'isola del sole. Rodi 1943-1945. I due volti di una tragedia quasi dimenticata. Il martirio dell'ammiraglio Campioni e dei militari italiani in Egeo e lo sterminio degli ebrei di Rodi e Coo. Firenze: La Giuntina. Moore, Shaunna, and Susan Pell (2010): Autonomous Archives. International Journal of Heritage Studies 16(4): 255–268. Pasqualini, Maria Gabriella (2005): L'esercito italiano nel Dodecaneso, 1912-1943. Speranze e realtà. I documenti dell'Ufficiostorico dello Statomaggiore dell'esercito. Roma: Ufficiostorico SME. Peri, Massimo, ed. (2009): La politica culturale del fascismo nel Dodecaneso. Atti del Convegno, Padova, 16-17 novembre 2007. Padova: Esedra. Pignataro, Luca (2010): Il Dodecaneso italiano 1912-1947. Forme istituzionali e pratiche di governo. PhD dissertation. Teremo: Università degli studi di Teramo. Rautenberg, Michel (2003): La rupture patrimoniale. Grenoble: A la croisée. Seraidari, Katerina (2006): Grecs orthodoxes et Grecs catholiques, ou comment définir son identité par la religion. Mésogeios. Méditerranée, histoire, peuples, langues, cultures 28:67–92. – (2010) Compétition entre Orthodoxes et Catholiques et production du sacré dans une île grecque. Ethnologie Française 40(1): 151–160. Sintès, Pierre (2010a): Retrouver Rhodes. Teoros 1: 37–45. – (2010b): Mi akodro de Rhodes: Paroles d’une communauté juive de la mer Egée entre mémoire et actualité. In Les échelles de la mémoire en Mediterranée. Études Méditerranéennes. Crivello Maryline, ed. Pp. 75–107. Arles: Acte Sud/MMSH. – (2011): A qui Rhodes? Discours d’appropriation et de mise en valeur touristique dans la vieille ville de Rhodes. In World Heritage and Tourism: Managing for the Global and the Local. Laurent Bourdeauand Sonia Chassé, eds. Pp. 1096–1108. Montréal: Presses de l'Université de Laval. Smith, Laurajane (2006): Uses of Heritage. London and New York: Routledge. Tornatore, Jean-Louis (2010): La reconnaissance pour mémoire. Un parcours dans l’espace de la mémoire de la Lorraine sidérurgique. In L’invention de la Lorraine industrielle. Politiques de mémoire, quêtes de reconnaissance. Jean-Louis Tornatore, ed. Pp. 161–191. Paris: Riveneuve éditions. Vittorino, Ettore (2004): Isole dimenticate. Il Dodecaneso da Giolitti al massacro del 1943. Firenze: Le lettere. 1 Since 2009, my work on Rhodes has been supported by the program “Balkabas: Les Balkans par le bas” (ANR-08-JCJC-0091-01, IDEMEC, France, funded by the Agence Nationale de la Recherche) and by the program “Religious Memories and Heritage Practices in the Mediterranean: Confessional Coexistence and Heritage Assertion” (PTDC/IVC-ANT/4033/2012, CIDEHUS-University of Évora, Portugal, funded by the Fundação da Ciência e da Tecnologia). 2 From 1917 until the end of World War II, the archipelago was administrated by the Italian fascist regime and considered a colonial territory of Italy. 3 For more details on the Catholics in Greece, see Frazee 2002 and Seraidari2006, 2010. The situation of the Catholics of Cyprus, whose population, like those of Tinos and Syros in Greece, is locally called Latin, seems to be closer of that of Rhodes (Constantinou 2009). 5 Pires (2010) has shown how a town square – an empty space par excellence – in Malacca (Malaysia) became an object of competition between local consumers (who wanted to keep the site as it was) and tourism managers (who wanted to transform the square into a vivid, colorful, and multifunctional tourist place). 6 During the Italian colonial period, the Catholic Church was the only institution authorised to deliver this kind of documents. 7 The shared devotion to Saint Anthony of Padua is in fact a common tradition in the Mediterranean (Albera and Fliche 2012). 8 This does not mean that money is not an issue for the community; acquiring funding for cultural heritage or charity purposes is an ongoing task for the clergy and some of the parishioners, since heritagisation does not directly create income. ISNART, Cyril. Self Heritage-Making and Religious Minority in Greece: An Ethnography of Heritage Activities outside of the Cultural Institutions In : Between Imagined Communities of Practice : Participation, Territory and the Making of Heritage [en ligne]. Göttingen : Göttingen University Press, 2015 (généré le 26 avril 2019). Disponible sur Internet : <http://books.openedition.org/gup/223>. ISBN : 9782821875494. Isnart, Cyril. “Self Heritage-Making and Religious Minority in Greece: An Ethnography of Heritage Activities outside of the Cultural Institutions”. Adell, Nicolas, et al.. 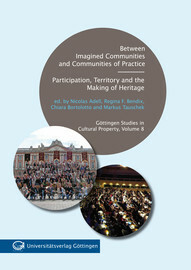 Between Imagined Communities of Practice : Participation, Territory and the Making of Heritage. Göttingen : Göttingen University Press, 2015. (pp. 171-183) Web. <http://books.openedition.org/gup/223>. ADELL, Nicolas (dir.) ; et al. Between Imagined Communities of Practice : Participation, Territory and the Making of Heritage. Nouvelle édition [en ligne]. Göttingen : Göttingen University Press, 2015 (généré le 26 avril 2019). Disponible sur Internet : <http://books.openedition.org/gup/191>. ISBN : 9782821875494. Adell, Nicolas, et al., ed. Between Imagined Communities of Practice : Participation, Territory and the Making of Heritage. Göttingen : Göttingen University Press, 2015. Web. <http://books.openedition.org/gup/191>.